We are professionals in the production of premium range of Conference Bridge as per the specific requirements of telecom industries. Entire process of development is checked on various parameters to ensure optimum performance, robust design and trouble-free operation. These are delivered at the industry leading prices within stipulated time frame to acquire total client satisfaction. Aria Telecom offers newly product “PARTH CONFERENCE BRIDGE” to connect multiple people on single group or multiple group conference. User can connect from mobile phone or landline. System automatically dials all group people at schedule time. 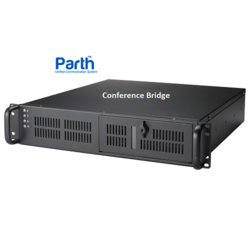 PARTH 30B is 30 channel embedded telephone conference bridge system. Can be connected with direct E1 line or through PBX, GSM PRI gateway etc. Parth 90B is 90 channels embedded telephone conference bridge system that suits your specific telecommunication business need. It is a simple way to generate multiparty telephone conference. It can be inbound and outbound calls. We have integrated our available resources to develop a premium range of Conference Bridge in compliance with the varied international quality standards. Tested at every stage of development, we make sure that our collection is free from any defects and flaws. A pre-defined conference ID and/or PIN with no expiry allows the organizer and participants to conference when required. Meetings can occur at any time using an established dial-in number and access code. The Conference organizer or Conferencing Service Provider can schedule a conference, send invitation emails to participants and have them register for the call. All participants who call in to an established dial-in number and enter the same PIN are connected together. Using this service connection occurs instantly and anonymously without any account setup. Instantly starts a conference call by dialing out to someone. Additional participants can be easily added as required; participants are provided the invitation over the phone and have the option to agree or decline to join the conference invitation. This is also used in highly secure instances where the organizer knows who to call and bring into the conference. These are useful in large or high profile events.